When it first announced the launch of its eReader Touch Edition late last month, Kobo referred to itself again and again as the "David" in a reader market full of "Goliaths." It's not difficult to see why -- the company's chief competition in the space is Amazon, Barnes & Noble, and Sony, all giants in their respective fields. In spite of overwhelming odds, however, Kobo has managed to stay afloat, and even competitive. True to form, however, Barnes & Noble launched its own device a mere day after Kobo, which for most intents and purposes, looks an awful lot like the eReader Touch Edition. In fact, the devices were seemingly so alike that we created a head to head, in order to see for ourselves precisely what set them apart. 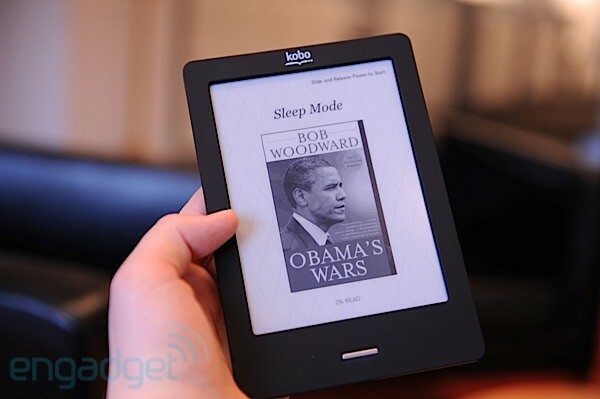 The new Nook also managed to beat Kobo's device to market, offering a more than worthy competitor to Amazon's latest. The question with the launch of the Kobo then, is not only whether the David can compete in a market so dominated by the Kindle, but if the eReader Touch Edition has enough to set it apart from the superficially identical Nook. How would you rate the eReader Touch? 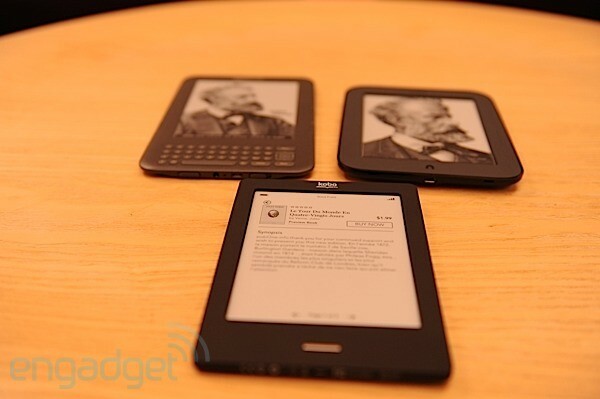 At first glance, the eReader Touch Edition looks an awful lot like the new Nook. In fact, we found ourselves mistaking the two on more than one occasion, reaching into our bag to grab one and coming up with the other. Both devices are significantly smaller than the third generation Kindle, a fact afforded them by the absence of a physical keyboard and the presence of a touchscreen. 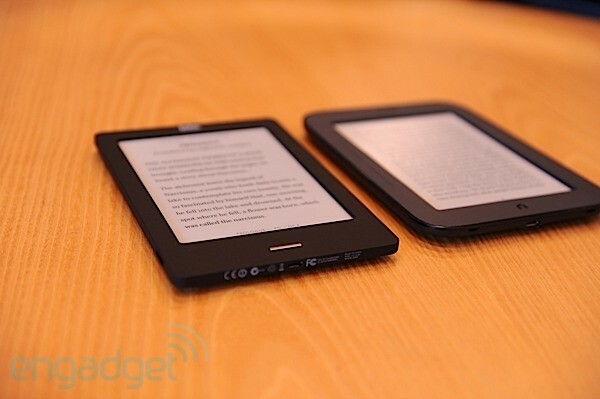 Placed side by side, Kobo's eReader is also noticeably smaller than the Nook. Both are roughly the same height (there's only so much you can do with a six-inch screen), but the Kobo is half-an-inch narrower and 0.7-inch thinner, really living up to its promise of being able to slip into a pocket, a definite selling point for anyone looking for a truly portable reader. The Nook's slightly larger footprint has a benefit, however, making the device easier to hold, particularly with its concave backing, which is easily gripped with a single hand. That's not to say the Touch is hard to hold, its small size and a latticed back offer up some grip. Lack of physical page turning buttons also helped the Kobo shed a few precious fractions of an inch off its sides. Like the Nook, however, rumors of the Kobo's single button were greatly exaggerated -- the reader actually has two: a narrow silver Home button on the front and a sliding Power button on the top. We're not entirely sure why Kobo didn't just go for broke and incorporate both of these features into the same button, but the presence of two buttons certainly isn't a deal-breaker. After using the Kobo for an extended period, we actually began to miss the Nook and Kindle's physical page turn buttons, which make it a lot easier to use the device with a single hand. The zForce infrared touchscreen is responsive, certainly, but doesn't afford the same sort of accuracy of physical buttons, and attempts at page turn swipes sometimes registered in the opposite direction or not at all -- reading for any extended length of time will probably require you to hold the tiny reader in both hands. Like the new Nook, the Kobo packs 2GB of on-board storage (1GB of which is available for actual book storage) -- that's half of what's offered in the latest version of the Kindle, but unlike the competition, Amazon's device doesn't have expandable memory via microSD. 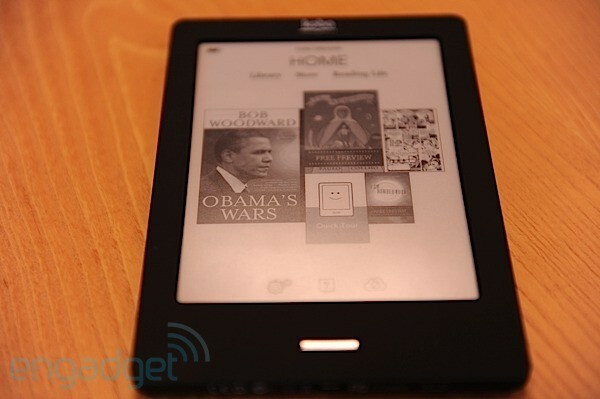 The Kobo and Nook are both expandable by up to 32GB -- that's a lot of books. Kobo's current battery claim is up to a month of life, depending on usage, versus the claimed two months on the Nook and Kindle. For most users, however, the difference in life in likely moot when we're talking about devices that can potentially last for so long that users will likely forget the last time the thing was charged. Inside the reader is a 800MHz Freescale i.MX508 processor, the same speed as the Nook, both decidedly faster than the Kindle's 532MHz processor. The speed is noticeable when zippily flipping through pages at a faster rate than on the Kindle, a process helped along by the fact that the devices only need to do a full page refresh (with the screen briefly turning black) every half-dozen pages or so. Like the Nook, the Kobo comes in WiFi-only, and while the device doesn't have Barnes & Noble's sort of brick and mortar infrastructure, the lack of a 3G likely won't be a huge deterrent for anyone, save for heavy travelers who absolutely must download books on the go. 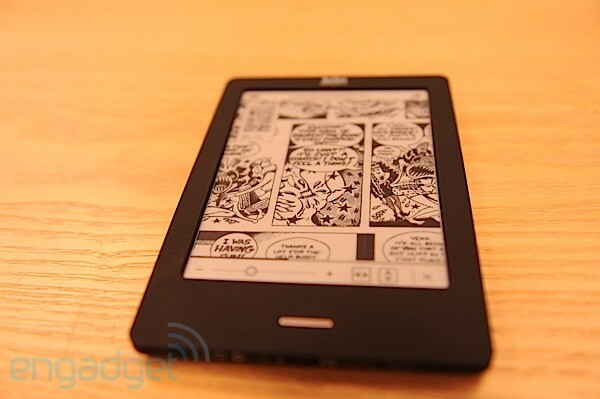 With all of the major players having adopted the technology, it seems safe to call Pearl E Ink the industry standard. 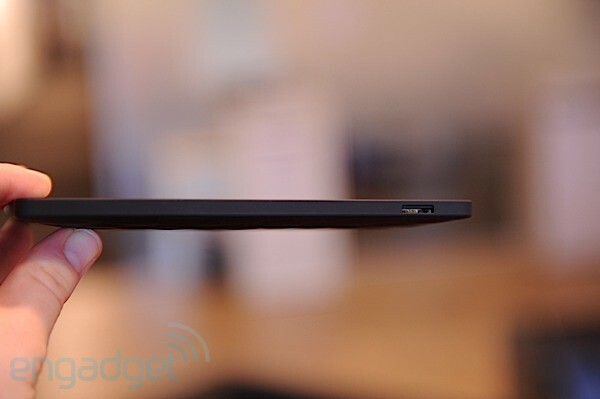 On that front, you won't really see any major differences between the latest devices. E Ink has its pluses and minuses, to be sure. For clarity, it's hard to beat, particularly with the latest Pearl technology. To the naked eye, it really does offer up the sort of contrast we've become accustomed to reading old timey paper books. The relatively low power consumption of these displays is also a large part of the reason we're talking about a battery life of a month or two. Of course the Pearl E Ink display has a relatively slow refresh rate and lacks color, the latter of which is certainly a strike against reading comics, children's books, and many magazines on the device. 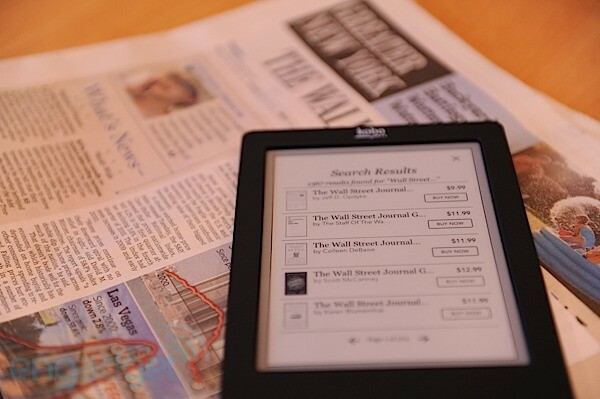 The eReader Touch is all about simplicity. While some of the competition is intent on blurring the line between e-readers and tablets, Kobo's device is firmly dedicated to its original intention: reading. There are very few features included on the device that detract from that noble pursuit, and as such, the Kobo is simple to a fault. No matter where you are, pressing the Home button takes you back to the Home page -- it's often where you're going anyway, but the inclusion of a simple Back command would have made navigation a bit more intuitive. The Home page is the hub of the device, and like just about everything else about the eReader Touch, it's stripped down to only the most necessary functionality. At the center of the page are images of your most recent purchases, which can be opened with a touch. Along the top are buttons for your library, the Kobo store, and the device's Reading Life competitive reading app. Along the bottom are icons for settings, help, and a cloud icon that syncs the info on the reader over WiFi with a touch. The reading experience itself is quite simple, the bulk of the page devoted to the text, with the title in small print along the top and your progress in a given chapter at the bottom. Readers can either swipe across the page or tap in the margin to go forward or back in the text. Tapping the bottom will bring up a small bar, offering to return you home (the same functionality as the physical Home button), advance in the text, or adjust the font -- the reader offers two styles and about a dozen sizes. Another icon in the bar offers a slew of options, including returning to the table of contents, updating bookmarks, marking the text as finished, and highlighting a selection. It's also possible to highlight a selection by holding down on it in the text. The touchscreen is a bit tricky for highlighting, and the process takes a little while to master. Once highlighted, you have the option to save the selection or look it up in the included Merriam-Webster dictionary. Unlike the Nook, the eReader Touch doesn't really offer much in the way of social functionality, surrendering the title of "the ultimate book club device" to Barnes & Noble's reader. Instead, it includes the company's Reading Life service, which makes reading a one-person competition (which, let's face it, it always has been for many of us). The app displays reading stats and offers up "awards" for doing things like finishing a book -- a fun feature for some, perhaps, but we suspect that the sort of folk who would go out of their way to buy a dedicated e-reader likely don't need that manner of motivation. The built-in shop offers up a number of categories to get you started, including New York Times Bestsellers, Oprah Book Club picks, and Free eBooks -- the latter, not surprisingly, doesn't offer much in the way of recent bestsellers, but there are some classic gems, like Anna Karenina. Due to the lack of physical buttons, search is conducted with a virtual keyboard, which is not ideal in combination with the zForce touchscreen, lagging a bit in response time. In fact, the whole of our interactions with the store were a bit laggy, in spite of our fast WiFi connection. We also ran into a problem downloading a title from the store, which refused to fully load, even after restarting the device several times. When we woke up the next morning, however, the problem seemed to have resolved itself. Like the Nook, the Touch has a "hidden" Web browser, a last minute addition that arrived with the latest software upgrade. Located in the Settings tab, the browser is still in beta and suffers from the manner of performance issues one would expect on a dedicated e-reader -- still, it's a neat addition, nonetheless. The Kobo also reads PDFs, which can be dragged and dropped onto the device from a connected PC. The reader shines in its PDF display functionality, letting you zoom in and out and pan across files, whereas most of the competition simply fits the documents to the page. Like most of the non-reading functionality, zooming and scanning within PDFs is not a particularly speedy process, however. For those looking for a device strictly for reading, the new Kobo is a nice little option. It's small enough to slip into a pocket, can do more with a PDF than the competition, and at $129, it's $10 cheaper than both the Nook and Kindle WiFi. There's also nothing in the way of social functionality on the device, but we didn't really miss it. Ultimately, however, the eReader Touch Edition has one fatal flaw: it's not as good as the Nook. The software can be a bit slow at times, and after using the Nook at length, it's hard to deny that physical page-turning buttons would be a nice option. Had Barnes & Noble not introduced the device and beaten Kobo to market, the eReader would be a serious contender for the title of the best devoted e-book reader on the market. As it stands, however, the device can't quite match up to the competition.